Breakfast is my favorite meal. Most mornings it’s pretty simple—oatmeal, smoothie or cereal. But on the weekends, I like to whip up something special. Lately I had been on a bit of a pancake kick, which was starting to get old. Pancakes are delicious, but they can be time-consuming to make. I wanted something easy, fast and delicious. And I’m happy to report I found the answer in the form of a dutch baby pancake. Besides scrumptious, they are sometimes called a German Pancake or a Hootenanny (yes, that name is absolutely the best). Typically cooked in a cast iron skillet, they puff up while they bake (similar to a soufflé) and deflate quickly after you remove the pan from the oven. It is more eggy than a traditional pancake and is often served with a dusting of powdered sugar and fruit. While pancakes remain a popular breakfast choice, it can be hard to serve everyone at the same time. I certainly prefer to eat my pancakes piping hot off the grill. Sure, you can keep them warm in the oven, but it’s not quite the same. This is where the dutch baby pancake excels. It is one humongous pancake that you cut into individual serving pieces, so no one has to sit and watch someone else eat while they wait for their pancakes. Nor does the poor cook spend the entire meal flipping pancakes while everyone eats and talks. 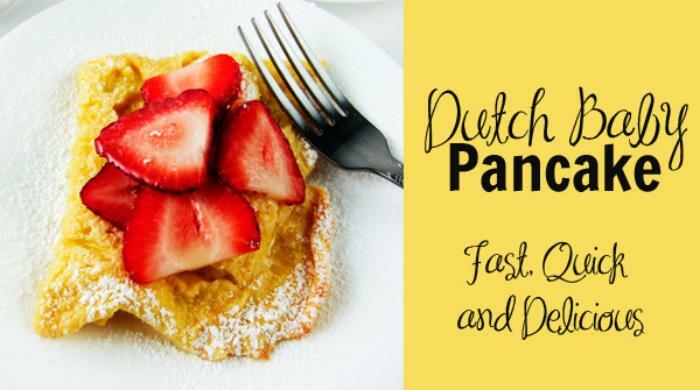 This recipe makes a big batch, which is great because you can feed a ton and if you have leftovers, they reheat beautifully too, I’ve been enjoying dutch baby pancakes for breakfast for the past few days. And it’s really nice to just cut a square, pop it in the microwave and breakfast is served. This will quickly become a favorite breakfast dish. It’s unbelievably quick to make and tastes so good. Two huge wins in my book! Enjoy! Preheat oven to 400 degrees. Place butter in a cast iron skillet, or 9×13 pan and let the butter melt in the oven. Do not let the butter burn. In a large bowl, whisk eggs until frothy, then stir in milk and vanilla. Slowly add flour, cinnamon and salt while continuing to whisk the egg mixture. Mix until fully combined. You can also do this in a blender too, instead of by hand. Remove pan from the oven and carefully pour the batter over the butter. Bake for about 15 minutes. The pancake will puff up (it will rise above the pan) and the edges and top should turn golden brown and be slightly crispy. Remove from oven and serve immediately (it will deflate). I like to serve mine with a dusting of powdered sugar and sliced berries. It would also be good with just maple syrup or your favorite fruits too.